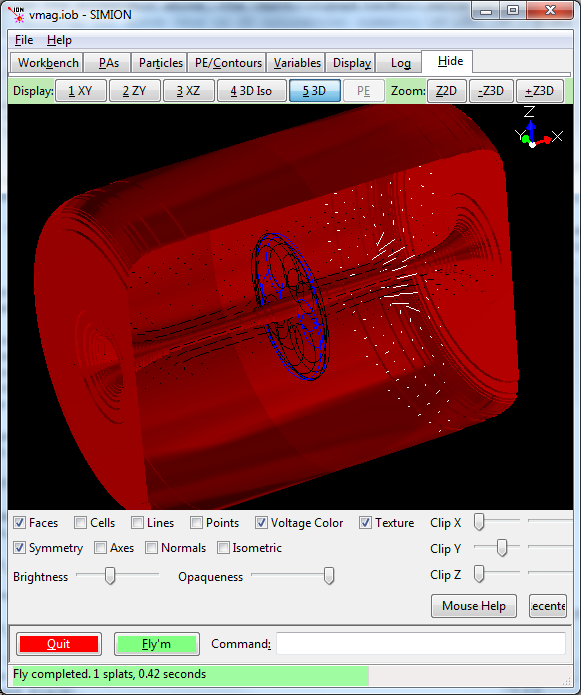 Poisson Superfish a finite element (FEM) field solver and set of programs for static and RF electromagnetic fields in 2D planar or 2D cylindrical symmetry. Shown here is how to import magnetic fields computed in Poisson or Pandira and exported by SF7 into SIMION. Magnetic fields are important to SIMION because magnetic fields affect the particle trajectories (Lorentz Force Law) simulated by SIMION. Various types of instrumentation and mass spectrometers simulated by SIMION incorporate magnetic fields. So, we need to determine the magnetic field. Calculation of magnetic fields can be a little complicated, and SIMION has some magnetic capabilities (Magnets), but SIMION is more established in the area of particle optics and electric fields than magnetic problems, so there are times we may want to import magnetic fields from other packages, typically based on the finite element approach (FEM). 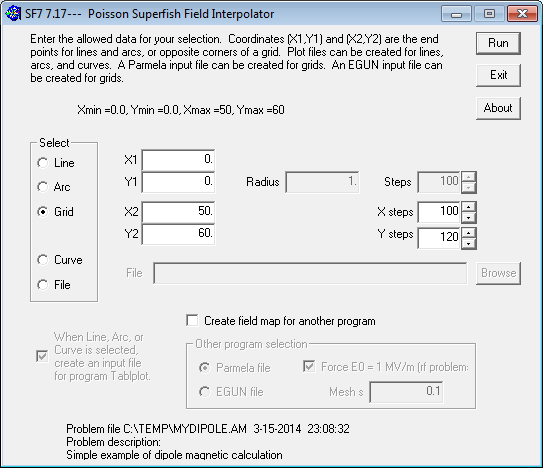 You may prefer the FEM approach and the magnetic capabilities provided in Poisson Superfish, so we ask how to export those fields from Poisson Superfish and import them into SIMION for particle optics handling and other analysis. In SIMION we are typically most interested in ultimately knowing the B field rather than the H field since the B field is used for calculating particle motion by the Lorentz Force Law. Nevertheless, it is also possible to import other quantities like the H field or if you so desire. It is recommend that you use SIMION version version 8.1.2.7 or above because that includes SIMION Example: poisson_superfish demonstrating the importation for fields from Poisson Superfish into SIMION. It also recommended using Early Access Mode (8.2) version 2014-03-14 or above because it includes the latest version of a field library (Field Functions Library (simion.experimental.field_array)) that makes the importation and magnetic vector potential A handling a bit easier, and the examples and this discussion utilize it. Nevertheless, it is possible to do much of this in earlier versions using SIMION Example: field_array in SIMION 8.0/8.1 and the SIMION Example: contour (contourlib81) in SIMION 8.1, though you are more on your own. These examples were tested in Poisson Superfish version 7.17 but probably will also work in older and newer versions as well. If not, let us know, and necessary minor adjustments could be made. Poisson Superfish SF7 can export A for 2D planar and 2D cylindrical and A for cylindrical (axisymmetric) symmetry, Poisson Superfish reports the values of r and A in units of cm and gauss respectively, whereas SIMION units are mm and gauss respectively, and the conversion routines converts between cm and mm automatically. Another approach would be to import and components of the magnetic field, each as a separate PA (e.g. “bx.pa” and “by.pa”). This is similar the SIMION Example: field_array (SIMION 8.1) and is also demonstrated in the SIMION Example: poisson_superfish (bmag.iob). This approach is less recommended because it requires two arrays and does not afford plotting the field lines as directly. This approach may be easier though if not using Early Access Mode, which has the simple Field Functions Library (simion.experimental.field_array) utility library for computing B from A. There are two ways to go about this. The simpler way is to export the data using the Poisson Superfish SF7 program (OUTSF7.txt) and then import that into SIMION as a PA or PA’s. The other way is to have SIMION read the data directly from the binary solution file (.t35). The former approach has the advantages of PAs, such as speed and visualization. The latter avoids interpolating onto a rectangular grid but rather reads and interpolates directly from the finite element mesh, so it has some improved accuracy and directness. The following process can be used to export field data from Poisson Superfish into a text file that SIMION can then convert into a SIMION potential array (PA). First go through the usual steps to solve the field. Create an Automesh file (.am) and run it in Automesh (e.g. by double clicking the file in Windows Explorer). This creates a binary solution file (.t35) as well as a an Automesh log file (OUTAUT.TXT). Solve the .t35 file in Poisson or Pandira (e.g. by right clicking the file in Windows Explorer and selecting Run Poisson or Run Pandira). You can view the resultant .t35 in WSFplot (e.g. by double clicking the .t35 file). Fig. 29 Running Automesh on the Automesh file (.am) to generate the binary solution file (.t35). Fig. 30 Running Poisson to solve the binary solution file (.t35). Fig. 31 Viewed the solved solution file (.t35) in WSFPplot. We can export potentials or fields to a rectangular grid in a text file using the SF7 Interpolator program (e.g. by right clicking the .t35 file and selecting Interpolate (SF7). 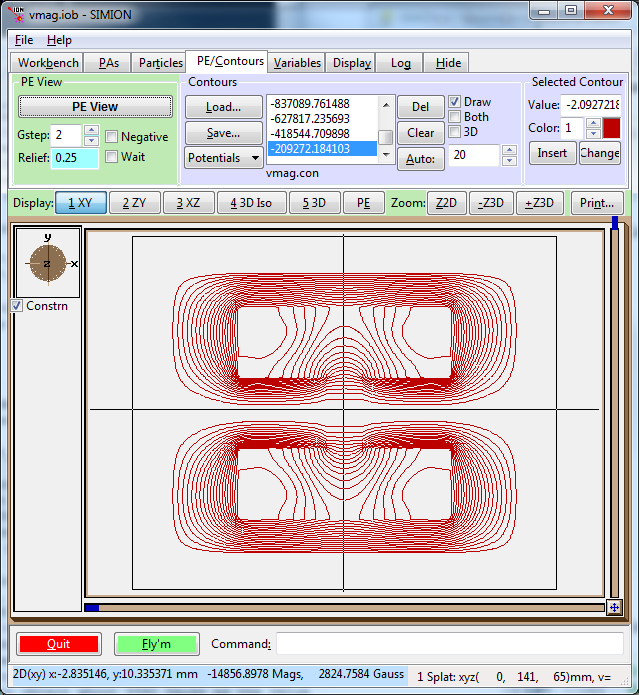 Select the “Grid” option to export a 2D rectangular grid of points, which is most suitable for converting to a SIMION PA. Specify the lower-left (X1, X2) and upper-right (Y1, Y2) points of the rectangle to export (the initial values are the full size of the problem space and may be suitable). Specify the number of steps in the X and Y directions. Note that this represnts the number of grid cells along each dimension. The number of points is one more than this. For example, if X1=0 and X2=50 and X steps=100, then there are 100 grid cells, each of size 0.5 cm, and 101 grid points surrounding those grid cells. The grid cell size should probably be roughly the size of the triangles in your Poisson Superfish mesh, or perhaps a little smaller for increased accuracy. If the exported cell sizes are much larger then than the Poisson Superfish mesh triangles, you will likely introduce significant interpolation error (if it is ok to throw away accuracy, then why not calculate your Poisson Superfish mesh at lower resolution?). If the exported cell sizes are much smaller than the Poisson Superfish mesh triangles, then this increases memory usage and conversion time while likely not increasing accuracy significantly since the largest source of error in the field may be due to the size of mesh in Poisson Superfish itself rather than in the interpolation on the SIMION PA. If in doubt, you can experiment with different cell sizes and see how small the cells need to be to keep their effect on SIMION results within a desired threshold. You would set the X and Y steps such that the grid cells are roughly square (triangles in your Poisson Superfish mesh are probably not too oblong either), though SIMION 8.1 no longer requires grid cells to be perfectly square (Anisotropically Scaled Grid Cells in SIMION). 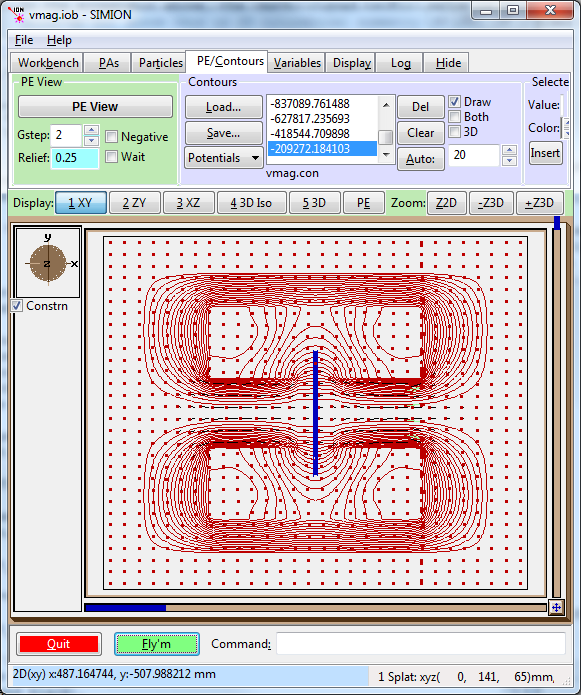 Note that the file indicates the field type (magnetic or electric), the symmetry (2D cylindrical RZ or 2D planar XY), and bounds of the array (Rmin,Zmin) and (Rmax,Zmax) in cm, the number of grid cells (R and Z increments), and the field data at each grid point. The field data includes most importantly the non-zero scalar component of magnetic vector potential (A) in units of G-cm. It also includes the B field vector (Br,Bz), as well as derivatives of the field (which we normally ignore). Now, anytime you enter regenerate() from the SIMION command bar within the View screen, PA instance #1 will be automatically recreated from the file OUTSF7.txt. This can be convenient if you need to edit the field in Poisson Superfish and re-export it to SIMION multiple times. You may need to resize the SIMION workbench (e.g. Min button on Workbench tab) or refresh the screen after regenerating. Converts a Poission Superfish SF7 text file into a SIMION potential array (PA). infile is that absolute or relative path to the OUTSF7.TXT text file to import. out can be the absolute or relative path to the SIMION PA file to write. If out is a SIMION PA, PA instance object (e.g. simion.wb.instances), or PA instance number (e.g. 1), then the field is imported into that existing object. The column identifir ‘rA’ is also supported, which multiplies A by r.
mirror indicates any additional mirroring that should be added to the PA. This is a combination of ‘x’, ‘y’ (e.g. ‘xy’). 2D cylindrical arrays only support ‘x’ (since ‘y’ is implied). If omitted, it defaults to ‘’ (no additional mirroring). Beware that any B values displayed in the status bar or Data Recording are actually , where F=A or F=r*A, which is probably not really what you want. Also any values of displayed are , which are the same as for 2D planar symmetry but are for 2D cylindrical symmetry. In the screenshot above, the value is about 2824 gauss*mm but since this is 2D cylindrical symmetry it must be divided by the radial distance y=10.3 mm to obtain about 274 gauss as the value for . You can now define particles, Fly them, and Data Record in the usual way in SIMION. Below shows the vmag.iob example in SIMION Example: poission_superfish. For simplicity of demonstration, only a single particle is flown. Fig. 32 2D view of flux function (F=rA) contour lines (red) and particles (blue). Fig. 33 3D view (Early Access Mode) of magnetic vector potential contour surfaces (red) and particles (blue), as well as contour library field vector planes (white and black). 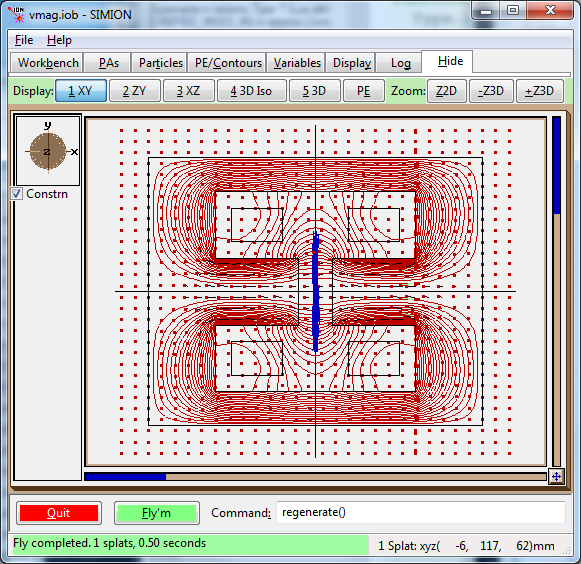 Besides PE/Contour functions, you can use the SIMION 8.1 contour library (SIMION Example: contour). This will plot vector fields and is especially useful if importing the B field vectors directly since there you don’t have a scalar potential to plot. The bfield property on the field array object is a function representing the B field, suitable for plotting or testing, and works with field arrays created from B and A. Some of the examples in SIMION Example: poisson_superfish utilize the contour library. First make a visual check. Draw contours in SIMION to see the field and ensure it looks qualitatively similar, as they are in the figures above and below. Also hover your mouse over the field in SIMION to measure physical dimensions to ensure they are the same as in Poisson Superfish WSFplot. Note that SIMION dimensions are by default in units of mm, whereas in Poisson Superfish they are in cm. Check the value of the B field on at least one point in both programs and compare. 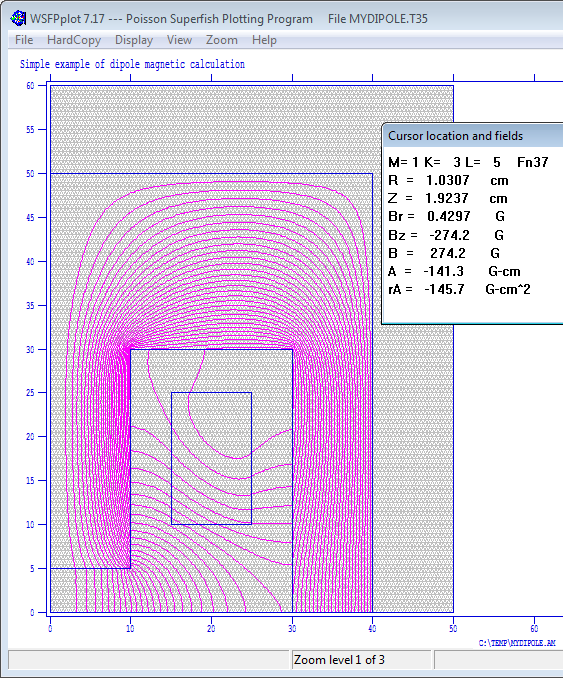 The WSFplot program can be used to read the field value at the given point by hovering the mouse over it. Alternately you can read field at exact points from the OUTSF7.TXT file. The default is to import the field without any information of pole/non-pole point types. So, you will not see the poles during visualization (apart from the contours), nor will particles see the poles for splatting purposes (unless of course you have an electrostatic PA or user program causing the splatting). The OUTSF7.txt file does not contain the pole information. You could redraw it in the Modify screen (e.g. Find/Replace and Change point type only). If you just way drawing, see the section below. The PA instance number (#1) should be a PA instance created from the convert function above. The region boundary lines will be positioned (translated/rotated/scaled) in the same way as this PA instance. Fig. 34 Example of drawing boundaries (black) from the OUTAUT.TXT file, in addition to the fields and trajectories. Draw region boundaries to graphics window given in Automesh file (OUTAUT.TXT). path - relative or absolute path to Automesh output file (OUTAUT.TXT). painst - PA instance created from the SF7 output. This is used to properly position (translate/rotate/scale) the Automesh geometry onto the View screen. It can be a PA instance object (e.g. simion.wb.instances) or PA instance number (e.g. 1). The geometry is positioned the same way the PA instance is positioned. If omitted (nil), no repositioning is done. swap - whether the X and Y coordinates from the Automesh output file are to be swapped (true/false). This is typically used for 2D cylindrical coordinates, where Y is the axis of symmetry in Poisson Superfish and X is the axis of symmetry in SIMION. If omitted (nil), this will be automatically set to true if 2D cylindrical symmetry is used and false if 2D planar symmetry is used. The symmetry is referred from painst, or if that is omitted, from the Automesh output file. color - color number (0..15) in which to draw region lines with. If omitted, it defaults to 0 (black). mark - whether to draw markers on region boundary logical points (true/false). If omitted, it defaults to false. You may for some reason want a PA with magnetic scalar potential rather than magnetic vector potential. 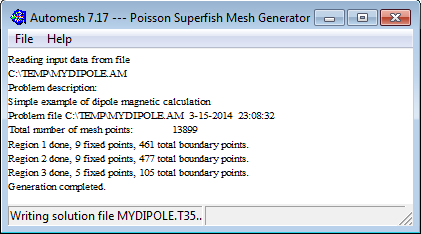 There does not appear to be an option of exporting the magnetic scalar potential directly from Poisson Superfish. It is not even always possible to do this uniquely on the whole domain, like when you have current sources. Before using that, you will need to copy the Poisson Superfish fld_msvc.dll file into your c:\Program Files\SIMION-8.1\x32\lib\ folder and run the 32-bit SIMION c:\Program Files\SIMION-8.1\x32\simion.exe. This DLL is only supported on the 32-bit SIMION. path - relative to absolute path to .t35 file. in the same way as the PA instance. If ``nil``, not re-positioning is done. This is similat to efield_adjust_from_t35 but for magnetic fields. path - full or relative path to .t35 file. Bx,By - magnetic field in gauss or electric field in V/cc. Az - magnetic vector potential in G-cm or electric voltage in V.
DBYDY, DBYDX, DBXDY - derivatives of Bx and By. Note: for 2D cylindrical problems, r is x and z is y. A units are gauss-cm. B units are gauss. V units are volts. E units are V/cm. Returns nil if point outside of problem space. Raises error on other problems. Reads variable from Poisson Superfish binary solution file (.t35). name -- name of variable to retrieve. val - real number, or nil if variable doesn't exist.